Some of the students of the Lunch Spaces Project; over 2000 students will benefit from this project. Over 2,000 students in nine primary schools in Belmopan, who prefer to stay at school during lunch, can now enjoy their meals in a pleasant environment as part of the Belmopan School Lunch Spaces Project, a venture which was inaugurated this afternoon during an official ceremony held at the St Martin’s Government School campus in Belmopan. The project was implemented by the Social Investment Fund, (S.I.F.) and financed by the Government of Belize at a total cost of $181,000.00 under the Commonwealth Debt Initiative (CDI). 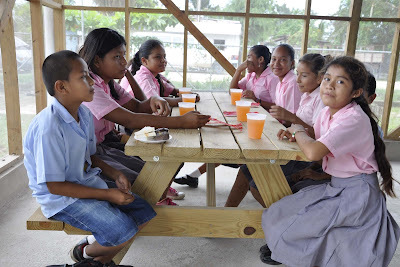 The project entailed the construction of five lunch spaces measuring 20 ft by 20 ft with wash hand basin and three lunch spaces measuring 20 ft by 30 ft at eight schools in Belmopan. These include: St Ann’s Anglican School, St Martin’s Government Primary School, United Evergreen Primary School, Belmopan Seventh Day Adventist Primary School, St Michael’s R.C. Primary School, Garden City Primary School, Kuxlin Ha Government Primary School and Our Lady of Guadalupe Primary School. Under the project, Belmopan Comprehensive School and Our Lady of Guadalupe High School received 15 picnic tables each. The lunch spaces were completed with floor slab, columns and zinc roof. The project also included nutrition training and food handlers training for teachers and persons responsible for feeding programs with a view to encourage the preparation of healthy food to students. 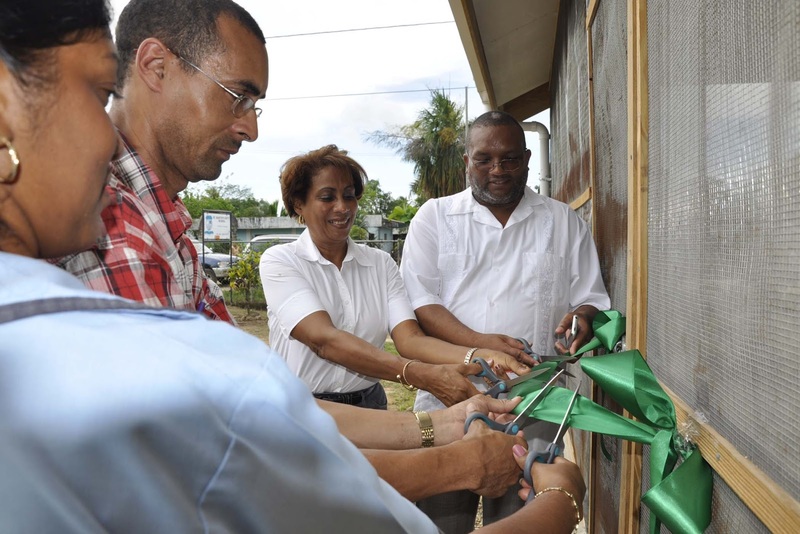 Belmopan has a total of nine primary schools and two secondary schools. The estimated total population of these schools is 4,572. The city of Belmopan has grown both by population and area since its inception. Hence, many students now attend a school which is not near to their home. With many parents commuting for work, the students are unable to go home for lunch. Subsequently, many primary schools have introduced feeding programs where the students pay a subsidized fee for prepared hot lunches, or the school has a canteen on campus where lunch is sold at reasonable rates. A community needs assessment conducted by SIF revealed that from the 4,572 students some 2,060 of the student population remain in school for lunch. Prior to the implementation of the project, the majority of the schools had no lunch sheds and many students had to sit under trees or other uncomfortable places during lunch. 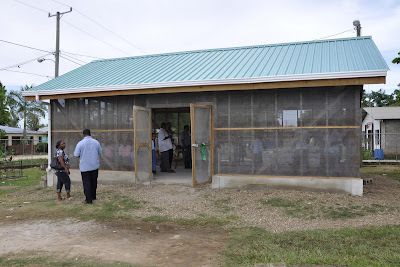 The guest speaker at this afternoon’s inauguration of the project was the Hon John Saldivar, Minister of Public Service, Governance Improvement, Elections and Boundaries and Sports and Area Representative for Belmopan, representatives of the Social Investment Fund and representatives of the participating schools. Lively presentations were also made by the students of St Martin’s Government School, Kuxlin Ha Government Primary School and St Ann’s Anglican Primary School. For further information please contact Mr Mike Hernandez Jr. J.P., Director of Public Relations of the Social Investment Fund at Tel: 822-0239 or via email at mike.hernandez@sifbelize.org or Cell No. 634-4002.